We are a professional backflow service company. We have trained staff to install, repair, and replace backflow devices of all makes and models in the area. If you are having trouble or are afraid your backflow device may not meet code, call us for an initial consultation. A backflow device is not only necessary to ensure the safety of the public water supply, it is also often a requirement for homeowners that meet certain criteria. For those who have pools or irrigation systems on their property, chemical connections to their main water line, or a well on their property a backflow system is required by the oversight board in Knoxville. To guarantee that your backflow device meets the requirements and is up-to-date and functioning properly call us immediately for a service call. Backflow devices are necessary to ensure the safety of the city’s public water system. Drinkable water is susceptible to contamination from chemicals and other pollutants unless a properly functioning backflow device is installed and operating correctly in homes that require them. Most backflow devices are installed at the point where a private homeowner’s water line connects to the communal water line. The backflow device is basically a valve that limits the flow of water in only one direction. Water is allowed to flow freely from the communal line into the homeowner’s private supply, but it prevents the homeowner’s water to flow back into the communal supply. Almost everyone is required to have a backflow device installed due to the possibility of contaminating the communal water supply and the devastating consequences that could result. Besides the possibility of contamination due to backyard pools or irrigation systems, a sudden decrease in water pressure on the communal line also increases the risk. It is not only to protect the communal line from homeowners but also designed to prevent contamination from problems caused by the design of the communal water supply system. There are some clues as to whether or not a homeowner needs upkeep and repair on their backflow device. If someone notices any of the following, it is best to call us immediately for a service call and inspection. If your valve is spitting from the vent, either continuously or intermittently, it is affecting both the supply and pressure. This is one of the most obvious signs of a backflow device problem and should not be ignored. It will not repair itself, so call us quickly. Any sudden drop in water pressure can have many causes. Chances are it is a malfunctioning strainer or an improperly sized valve that is too small to handle all the water flow. Often times, a replacement valve of the right size is enough to solve this minor problem, so you should call us for a quick inspection. A valve that has been originally installed improperly or even installed backwards will lead to many problems. Improperly installed valves are a minor problem, but if left unattended, they can lead to major problems that are far more expensive, so call us right away to take care of it promptly. If water is overflowing or spilling there is most likely a problem with the check valve or springs. This is a serious problem that requires professional repair service. It can also cause landscaping problems if the overflow is great enough and case you additional expense in the future, so call us immediately. If a valve continues to malfunction after installation or if a problem is not corrected after repair, please call us for a second opinion and the reinstallation of the part done properly. There are many other problems that can affect a backflow device. Some are minor problems and some are major problems, but all need to be inspected and corrected to maintain a clean and healthy water supply for the community. If you notice any problems at all or notice a change in the water pressure or quality of the water in your home, call us for prompt service. There is no problem that we have not encountered before and we have the expertise to tackle your specific problem in the shortest amount of time possible. We have the best trained staff and we use only the highest quality replacement parts to guarantee that our customers are satisfied. 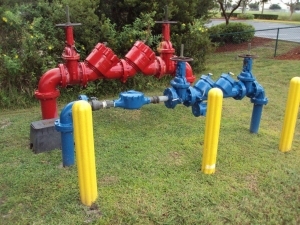 We offer prompt service and will discuss with you the various options available to you regarding your backflow system. Whether you need a simple backflow repair or a major overhaul and complete backflow replacement, we are the company that can do it. We also have a great deal of experience installing backflow devices if you do not currently have one but find you need one to keep up with the village codes. Whatever the problem, we are the solution. Call s today for an initial consultation so that we can work together to solve your problem.